I know I give the nursery industry a hard time, but I try to also give credit when credit is due. Well then, kudos to the great minds in the industry that are finding, creating, and promoting dwarf evergreens. Dwarf evergreens are usually propagated from freak varieties found in the wild, though occasionally nursery growers develop dwarf varieties through genetic fiddling. 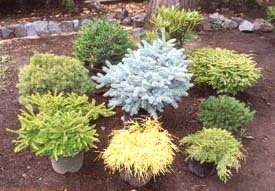 Small evergreens are simply plants that by nature don’t get very tall, having instead a tendency to spread horizontally. For us northerners, is there a cooler group of plants? Small city lots, large suburban lots, foundation plantings around homes of any size, this is the north, we have winter, you have to use evergreens. And when they delight the eye 365 days a year, as do the dwarfs, what could be better? First photo is a collection of evergreens just before they were planted in my new front entrance landscape. I’ll show how that project is developing next update. 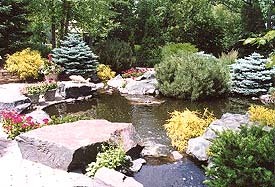 The second snap is a garden in Eden Prairie that was on the Healing Gardens tour this year. Buy these things, get them into your yards, go forth and be fruitful, etc., etc.